Born and raised in New Hampshire, Randy was active in band, drama, and several outdoor sports before he climbed his first mountain at the young age of 10. Randy went on to earn his BSEE from the University of New Hampshire, then began a successful career at Digital Equipment Corporation as a hardware design engineer. At the age of 22, Randy unexpectedly lost his vision over the course of a short two weeks due to a devastating neurological disease. Still passionate about sports, Randy found ways to continue to enjoy football, basketball, baseball, and even darts! His advancement in karate through his second-degree black belt helped him improve focus and orientation and excel at many of the challenges he faced through his blindness. Ostend was Randy’s first Dog Guide and constant companion. 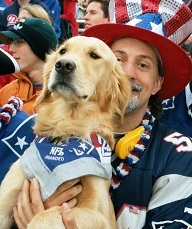 Randy’s lifelong passion for New England Patriots football came full circle when he was named “2001 Fan of the Year” with Ostend at his side, and then in 2002 was inducted as a fan into the Pro Football Hall of Fame in Canton, Ohio. His “Patriotic” fame led to an HBO feature on his life “HBO Inside the NFL Fanlife: Randy Zip Pierce” which was nominated for a Sports Emmy Award in 2008. At the age of 39, the neurological disorder which ended Randy’s vision suddenly attacked in other ways, resulting in his being confined to a wheelchair. 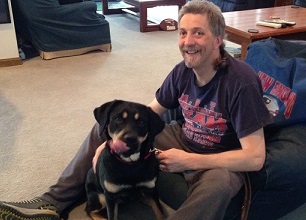 Randy spent the next two years working to get out of that wheelchair and in time was fully back on his feet with his new Dog Guide Quinn at his side. In 2010, Randy set a goal to be the first blind hiker to summit all 48 of the New Hampshire 4,000-footers during the summer hiking seasons over 10 years. However, he quickly accelerated his pace. In 2012, he accomplished all 48 peaks in a single winter season — the winter season offering fewer challenges in terms of footing — and then on August 24, 2013, with Quinn at his side, he completed his original goal of climbing all 48 peaks during the summer seasons, just 37 months after he began his quest. But what do you do when you accomplish your 10-year goal in just 3 years? You create new goals, of course! 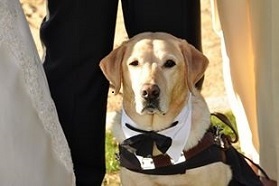 Early in 2014 Randy welcomed his new Dog Guide Autumn and after running his first marathon in May, successfully completed the April 2015 Boston Marathon. Randy traveled to Tanzania in September 2015 and climbed the iconic Mount Kilimanjaro with a team of 10 of his friends, reaching the summit on September 26, 2015. Randy battled health problems in the winter of 2016 but still managed to complete the 2016 Boston Marathon in April. In September, 2017 Randy traveled to Peru with 13 friends to visit Machu Picchu and spent 4 days hiking through the Andes Mountains to reach Rainbow Mountain. Randy’s passion for new experiences continues to encourage him to turn adversity into growth and opportunity, inspiring others to reach their peak potential as Randy has and continues to do.